Hsp90-regulated gene networks in idiopathic pulmonary fibrosis (IPF). (A) Venn diagram depicting the comparison and overlap of differentially expressed genes in IPF lungs and 17-AAG treatment (from LINCS). 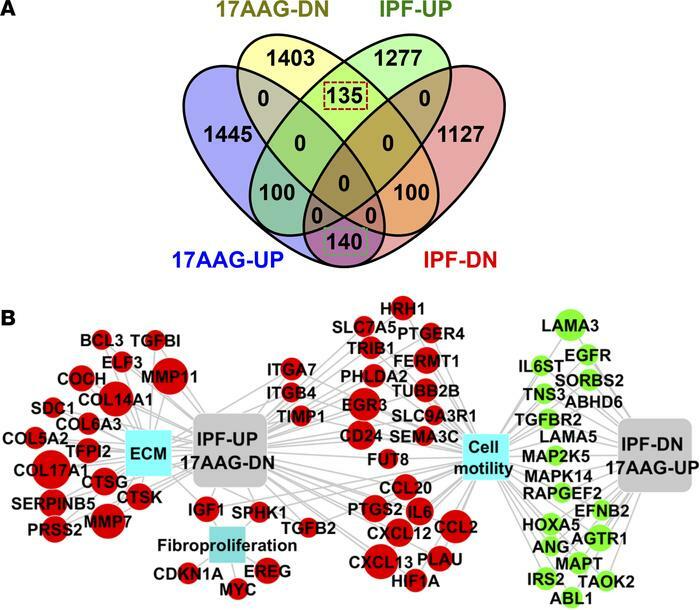 Of the 2,879 genes differentially expressed in IPF lungs, 475 genes overlapped with differentially expressed genes following 17-AAG treatment. The box indicates genes that are up- (135 genes) or downregulated (DN, 140 genes) in IPF lungs compared with 17-AAG treatment. (B) Hsp90-driven gene networks that are activated in IPF were analyzed using ToppFun and visualized using Cytoscape. Red- and green-colored circles represent genes that are up- and downregulated respectively in IPF lungs. The blue-colored squares represent enriched biological processes for the inversely correlated genes between Hsp90 treatment and IPF.